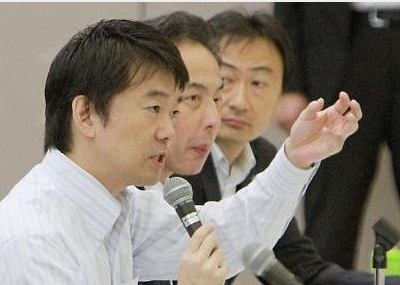 In a picture taken on Sept 9, 2012, Osaka Mayor Toru Hashimoto speaks at a policy debate to establish the new national party 'Nippon Ishin no Kai (Japan Restoration Association)' in Osaka. The outspoken and colourful Mr Hashimoto is increasingly a force to be reckoned with on Japan's often grey political stage. His abrasive wit and outsider status set him apart from the air of entitlement among establishment lawmakers, many of whom are second or third generation parliamentarians.